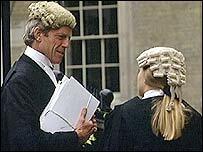 The ancient rank of Queen's Counsel for elite barristers has won a temporary reprieve from the government. Lord Chancellor Lord Falconer last year launched a consultation which mooted scrapping the QC system. Now he says the appointment of QCs will continue after a two-year suspension and will continue for at least the next three years. Ministers will no longer appoint the QCs - although they can veto names put forward by the legal profession. The 400-year old system of QCs, also known as "silks" was branded uncompetitive in 2001 by the Office of Fair Trading. QCs are entitled to charge higher fees than other barristers but there have been complaints about varying quality. But Lord Falconer said the consultation had shown the system was internationally recognised as a kite mark for quality and it brought a lot of money into the country. A review is continuing to see whether QCs should be kept for good. The lord chancellor told BBC Radio 4's World At One: "We are looking at the market overall and looking to see whether kite marking arrangements can be made to help the public across the board. "If those researches revealed there was some other system then that might involve abolishing the QC system at that stage but I cannot justify doing it at this stage." Under the new scheme, the Bar Council and Law Society will select candidates through "open competition". The secretary of state for constitutional affairs will then recommend those candidates are approved by the Queen, although he or she could block names "in exceptional circumstances". The Bar Council welcomed the decision to keep a system which "underpinned quality". But the Conservatives branded the interim regime as a "complete mess".